The recent tragic death of Cory Monteith (star on Glee) put the show’s writers and producers into the dilemma of how they needed to rethink the next season and “rewrite the scripts” for some of their fall opening shows. Those words made me think of how my own mother is rewriting the script for how our family deals with her eventual moving on to another world/dimension/reality/heaven. Mom turns 89 on July 30 and we hope to have her another ten or more years but I’ve been touched by her forward thinking and modeling. 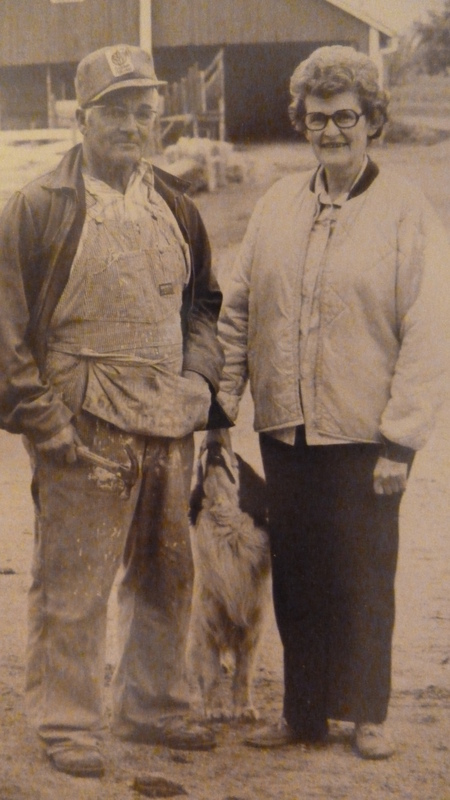 Dad and Mom on the farm with faithful dog, Buster. Photo by (then) Mennonite Board of Missions for Sent magazine on Mom and Dad serving in the SOOP program in South Texas in the 80s. Soon after my dad died in 2006 from complications of diabetes, Mom informed us that she was checking into what it would mean for her to donate her body to science. Not just her organs, her whole body, to a medical school program for research. They had discussed the possibility for him but never made clear plans, but now she wanted to follow through for herself. Dear mom has grown increasingly and surprisingly “progressive” in her later years in many (but not all) ways. 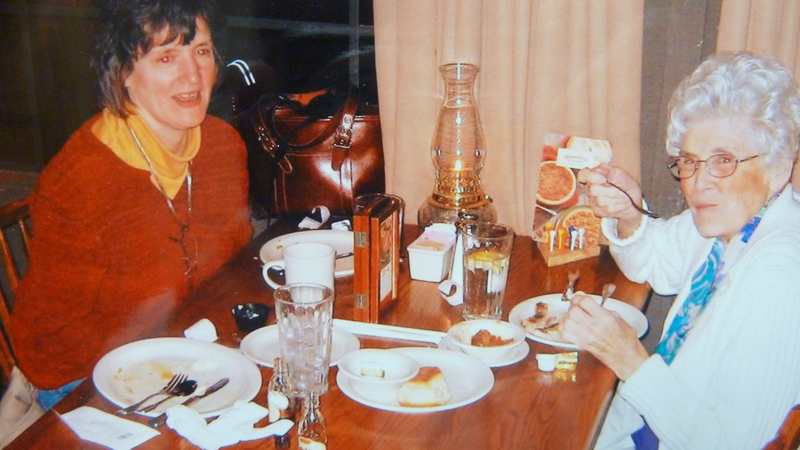 Me and Mom at one of her favorite restaurants, Cracker Barrel. “Dear children, I wanted to let you know what I’ve been thinking and taking care of regarding details after I die. I hope that is not for a long time but even before your Dad died, we had discussed and sent for information from Indiana University’s bodies for science program (official name is Anatomical Education Program). We had heard of others who did this partly as a way to save money and the costs of burying and funeral home expenses, but also because it is something I want to do for the good of other people. This decision did not come lightly; I have thought about it over the years since then after getting information and recently signed papers (using witnesses from my building here at Juniper) that I want by body to go to I.U. soon after my death. They use it in their educational programs for 18 months to 2 years and then return the ashes to the family, which is what I want. I believe that the Bible teaches “from dust we are and to dust we will return” and there is nothing special about our bodies, but about the soul that lives within us. We will have a new form or spirit in heaven. Daddy and I both felt that as soon as we die our souls are “together with the Lord” forever. If I can contribute something useful to research and science by giving my body as a final act of my stewardship and service for God, I want to do that. I haven’t quite gotten to the place where I would follow her example, and this may not “be for you” –but I share it in love and respect for my mom who I admire for making this decision and taking the steps necessary to deal with what is a difficult topic for many of us. My own husband and I have batted around ideas about what we want to happen, but taking the time and emotional energy to really discuss it with our children is not something that just happens; you have to plan for it. Having plans for the immediate aftermath—especially in the case of an elderly loved one—can ease the grief, pain, and loss for the family. Love you, Mom, for your courageous example in so many ways and willingness to rewrite the script. Top: One of my fav photos of Mom and Dad circa 1995. 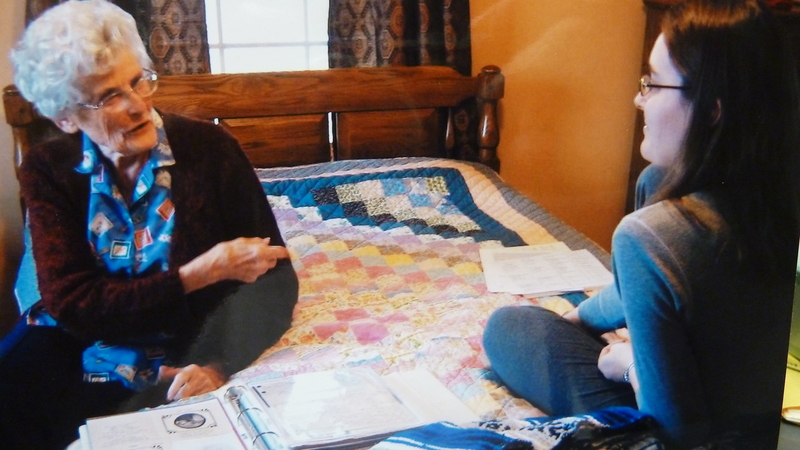 Bottom: Mother discussing family history with our oldest daughter and family historian, Michelle. What plans have you or your loved ones made? Feel free to use any part of Mom’s family letter above in addressing these questions with your family. Another resource the readers of Another Way column helped me create a few years ago is called Loving Legacy. This short folder is designed to help parents and adult children deal with the issues not covered in other documents for the aging years, such as “Tell me when to stop driving” or “Tell me when it is not safe for me to live by myself.” You can get a PDF copy here or comment and ask for a free printed copy by mail. Yes–and she will see this too–I usually print certain blogs out for her to see. She enjoys them. Thanks for sharing her wishes with more people. Love it. My grandmother donated her whole body to research as did my friend’s husband. I admired that. My friend said the only difficult part was that the university sent her her husband’s ashes back to her by mail without warning. 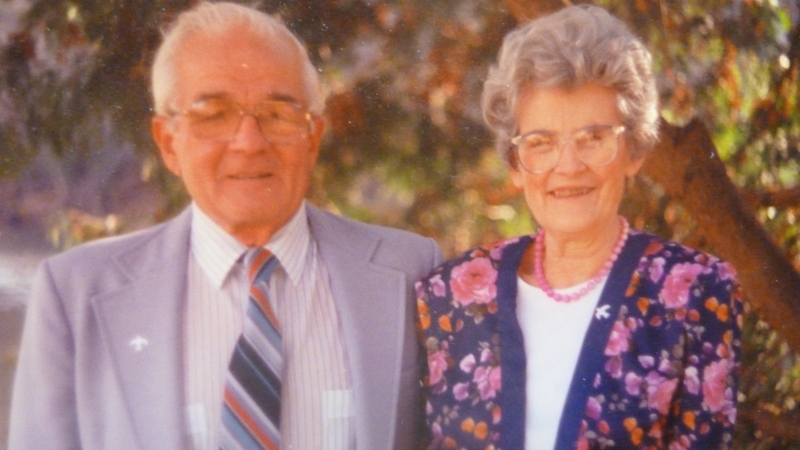 It was only about a month after he died; she was not expecting the ashes to be returned so soon or so unceremoniously. Not something one expects to find in one’s mailbox out of the blue. Oh my–I totally agree! That would be a jolt. Thanks for your comment, Jill.